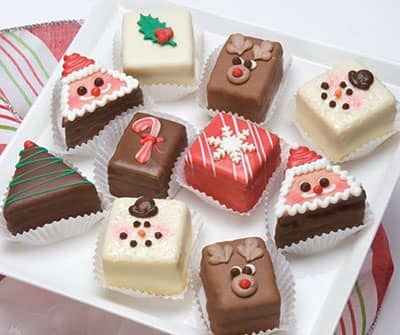 Our Christmas Petits Fours are a fanciful assortment of holiday shapes and colors. Makes a charming gift or share with your family on Christmas morning to create a new holiday tradition. A fanciful assortment of holiday shapes and colors as delightful as it is delicious. Each petit four is a miniature layer cake dipped in chocolate and decorated by hand. Makes a charming gift, or share it with your family on Christmas morning to create a new holiday tradition. This assortment of 12 petits fours includes: Marzipan Santas, Red Raspberry Snowflakes, Triple Chocolate Trees, Truffled Mint Candy Canes, White Chocolate Snowmen, Bittersweet Strawberry Holly Leaves and Chocolate Truffle Rudolph the Red Nosed Reindeer.